Dr. Kanani has unveiled his revolutionary method of conducting dental implants procedures. Dr. Kanani, a popular dentist in Woodland Hills has unveiled his revolutionary technique of inserting dental implants. Dr. Kanani’s dedication to oral surgery has encouraged him to design a new method that successfully brings the cost of dental implants down to $699.00. On top of that, his patients have been known to undergo a shorter recovery period and less pain post-surgery as opposed to those who opt to undergo the conventional method. According to this general dentist in Woodland Hills, it is important that patients fully understand the difference between the conventional method and his revised method before a making a decision on which one to undergo. In a nutshell, getting dental implants means that the patient is going through oral surgery to replace missing tooth or multiple teeth. A slim titanium shaft is meticulously implanted into the jawbone and left to set. This shaft is known as the dental implant. Over a period of several months, the surrounding bone and tissue will then grow around the dental implant. This growth will either slow or stop more bone loss from occurring. Only when the dental implant has finally set will the dentist carefully attach the replacement tooth over it. Conventional Method of Inserting Dental Implants. The conventional method of inserting dental implants is commonly known as the Flap Procedure. Most family dentists in Woodland Hills are able to perform this procedure. The Flap Procedure encompasses the dentist slicing through the gums and drilling into the jawbone to create a hole. The titanium dental implant will then be inserted into this hole. Sutures will then be done onto the gum to cover the gap and it will be left to heal. According to Dr. Kanani, the healing process varies according to each patient but should take between four to six months to heal. Many patients who choose to go through dental implants already suffer from moderate to severe jawbone reduction. This is because these patients have been living with tooth loss for extended periods of time. In cases such as these, a bone graft surgery has to be done before the dental implants can be inserted. This brings up the dental implants cost as patients have to have a small black of bone removed from another part of the body. This block of bone will then be inserted into the jawbone. The block of bone plays host to a solid base into where the dental implant will be inserted into. Most of the time, it will cost patients over $4,000 just to go through the bone graft surgery. Dr. Kanani’s Method of Inserting Dental Implants. As the top Woodland Hills dentist, Dr. Kanani has devised a way to eliminate the need for black bone graft surgery. Not only that, he also does without painful cutting and drilling. Termed the Flap-Less/Drill-Less Surgery technique, Dr. Kanani will use a series of dental equipment to expand the jawbone. A small gap will form and he will then insert the titanium dental implant into it into it. 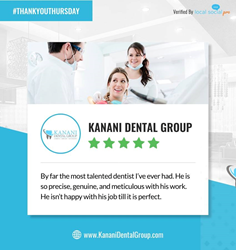 Patients of Dr. Kanani’s have attested that they went through short recovery sessions and that their dental implants cost less than expected. Finding someone who specializes in general dentistry in Woodland Hills is not very difficult. However, one will be hard pressed to find someone as talented as Dr. Kanani. Dr. Kanani recommends that patients meet with him to discuss the various oral surgery procedures that they can go through. The good news is that he is offering first-time patients a complimentary consultation, so those who are interested should call (818) 962-1141 or visit http://www.woodlandhillsdentalspa.com.